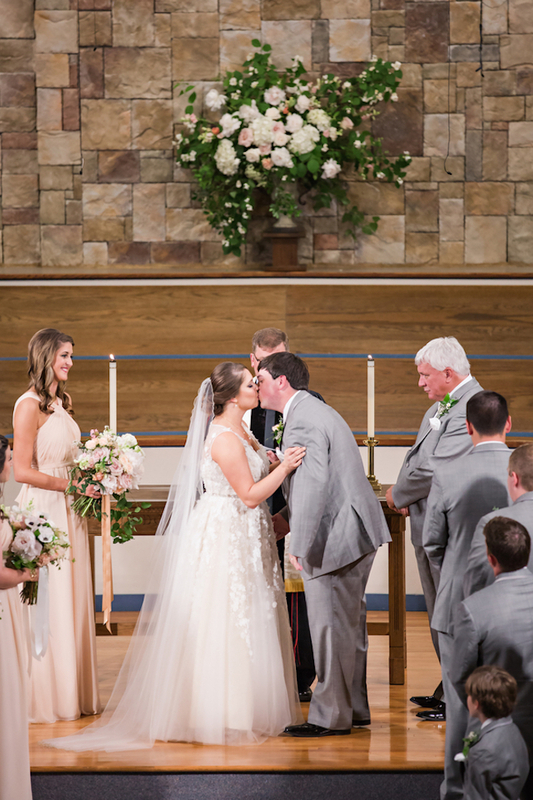 Today we step into Katie and Nick’s secret garden wedding celebration in South Carolina – it’s an ivory blush pink and gray wedding simply gushing with florals and elegant, romantic details. 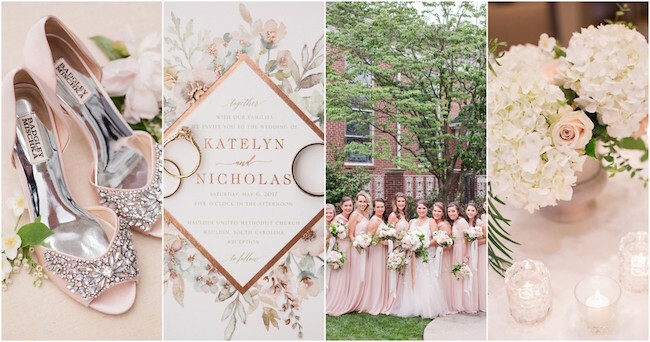 The color palette also included touches of mint, light gray and a gold metallic accent. 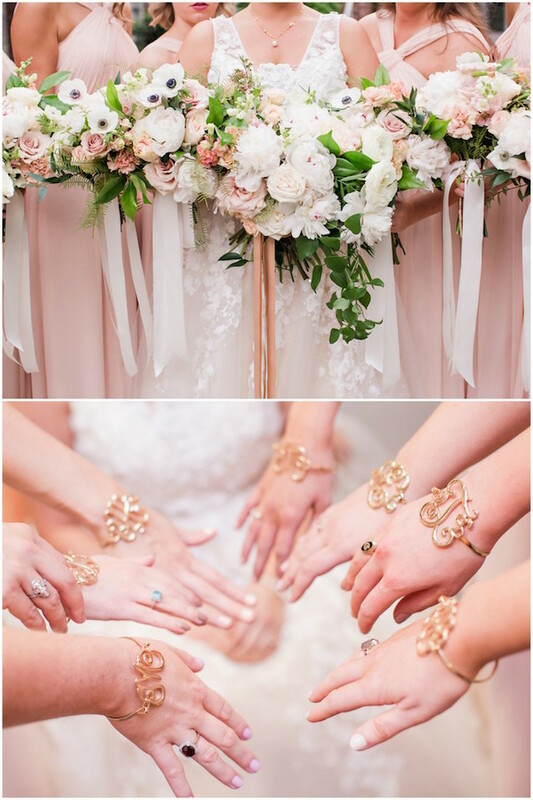 And you know how we love us a beautiful blush wedding! Katie grew up loving the book and the movie ‘The Secret Garden,’ but was terrified of rain ruining her spring wedding. She planned a weather-proof indoor celebration based around whimsically romantic florals, soft colors, and an overall aesthetic to bring the magic and romance of a secret garden inside. 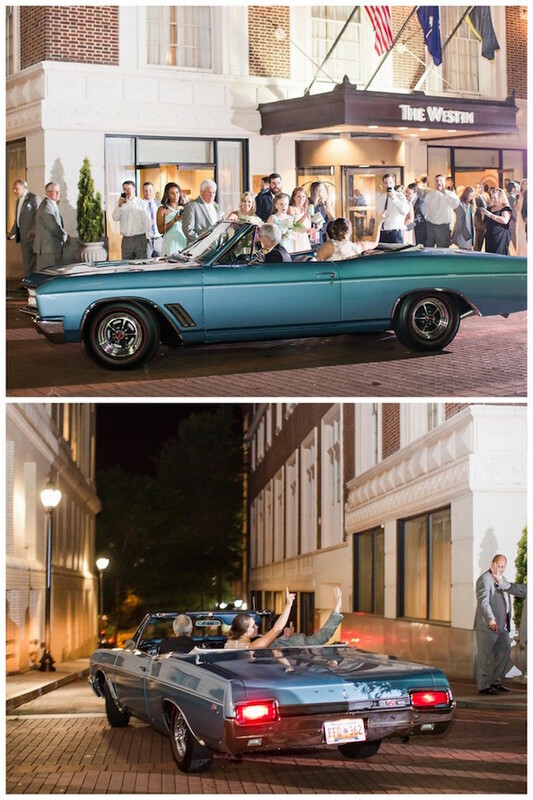 As it turned out that it did rain for a few hours on their wedding day, so Katie made the right choice! 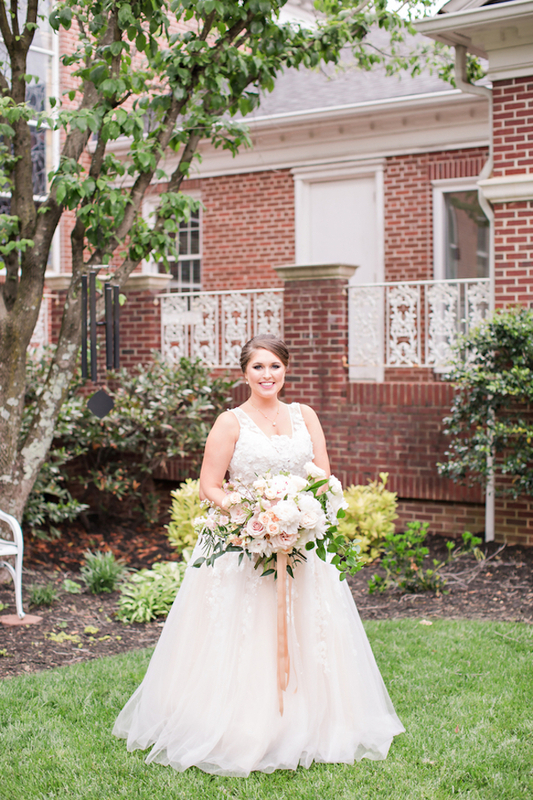 “Our wedding was Secret Garden ivory, blush and gray wedding very romantic and classic Southern. Nick and I are very traditional people, and we wanted to make sure our wedding showed how much we value marriage, and this wasn’t just all about the ‘party’,” shares Katie. Their reception featured all of their favorite fried and roasted foods on a Southern Buffet alongside macaroni pie, broccoli casserole, and more! Katie’s dad brought in cases of craft beer, too! 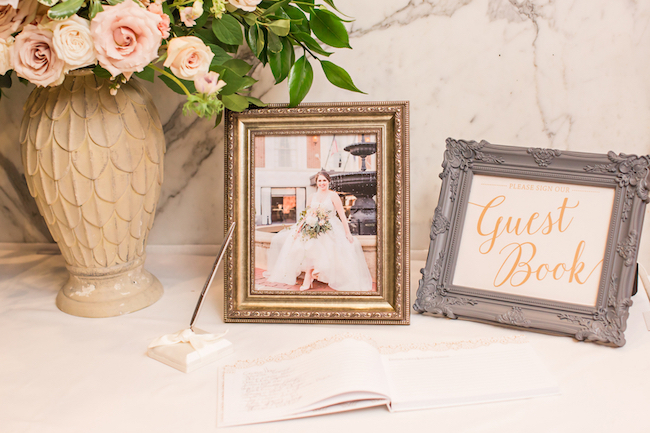 Stay tuned for images captured by Jennifer Stuart Photography which include a delicate blush Jenny Yoo bridesmaids gowns, a spectacular BHLDN wedding dress, stunning stationery from Wedding Paper Divas and Minted, plus loads of cute Etsy details, too! Love Story: Nick and I met at the annual Cooper River Bridge Run in Charleston…although neither of us were running the race! We hit it off, had drinks together that evening, and two weeks later, we had our first date in Greenville. Things went so well that I stayed in Greenville the entire weekend, and even met Nick’s parents then too. The initial spark wasn’t a fluke; we were a true match! After two years of dating, we decided to take a big step in our relationship by purchasing a house together. On the weekend of our closing day, we took our families by to see the soon-to-be home before we officially got the keys. While I thought we were posing for a photo in front of the new house, I turned to see that Nick had gotten down on one knee. He had an engraved key fob for my new set of house keys that said “Marry Me?” and of course, the engagement ring of my dreams! It was such a surprise, and the perfect way to start our lives together. Our bridesmaids all wore Jenny Yoo chiffon blush gowns that crossed in the front by the neck, and tied in the back. I loved the gentle draping and the romantic blush color. We all had airbrush makeup, and everyone had a half-up, half-down look complete with whimsical braids and loose curls. I wanted everyone to have light, fun hair that was romantic and almost fairy-like. Truly like we were young girls again in a secret garden. My dress was a gown from BHLDN. I love for my fashion to reflect my personality, and this ball gown was THE DRESS the moment that I saw it. It was ivory tulle with a champagne lining, and then 8 layers of tulle and a full skirt. All over the dress were floral appliques and I also had a custom lace floral applique sown onto the chest to cover up a spot that showed a little too much of the ladies! The dress was romantic and elegant, but also fun and different and unique – which is exactly how I would describe myself! For our bouquets we used a lot of greenery and natural elements, sticking to the Secret Garden theme. All the bouquets were full and lush and all of them had cascading ribbons included to tie the stems together. 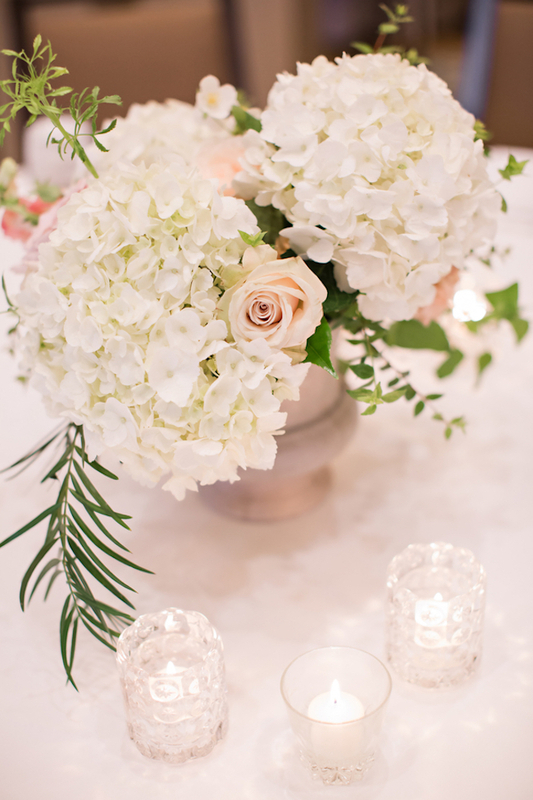 We had peonies and hydrangeas, anemones, garden roses, and many other lush and full flowers. 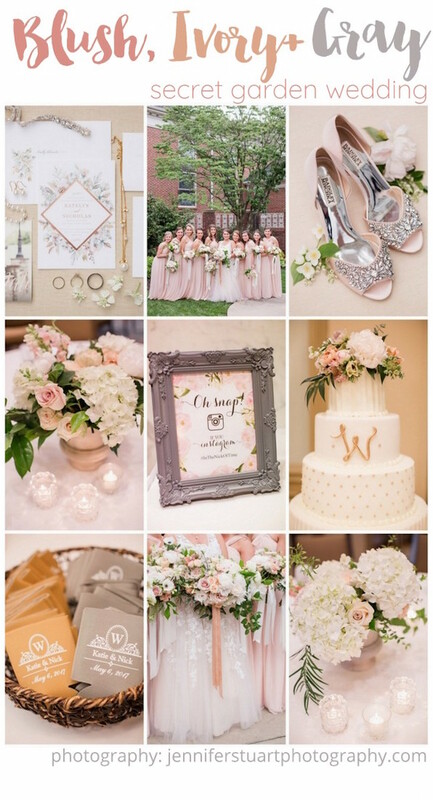 The colors were blush and ivory with small accent pops and a ton of greenery. My hubby was in a light gray Calvin Klein suit, with all white shirt, tie, and pocket square. Our ceremony was decorated very traditionally, with one large altar piece that was filled with lush flowers and greenery, two traditional ferns that are always lush at our church, and six unique and beautiful aisle markers. I grew up Catholic, and Nick is Methodist, so even though we were married in the Methodist church, it was very important to me to have a song that showed honor to my Catholic background. I remember growing up loving listening to the organ and choir at Christmastime signing Ave Maria, which we had playing on the organ for the grandmothers entrances to our ceremony. 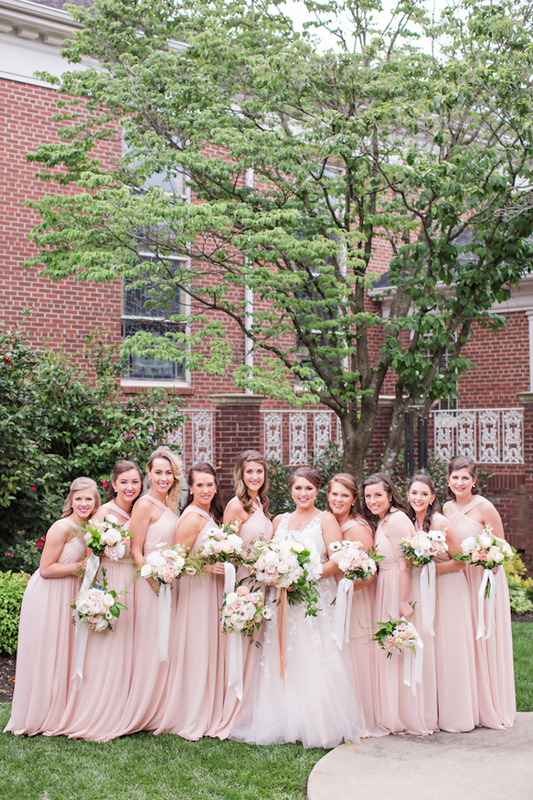 Check out this gorgeous outdoor garden wedding filled with florals! The arrangements for cocktail hour were tasteful and centered around lanterns. They did one beautiful and large arrangement for my quest book table as well. The floral decor was the highlight of our wedding (other than the bride and groom, obviously!) 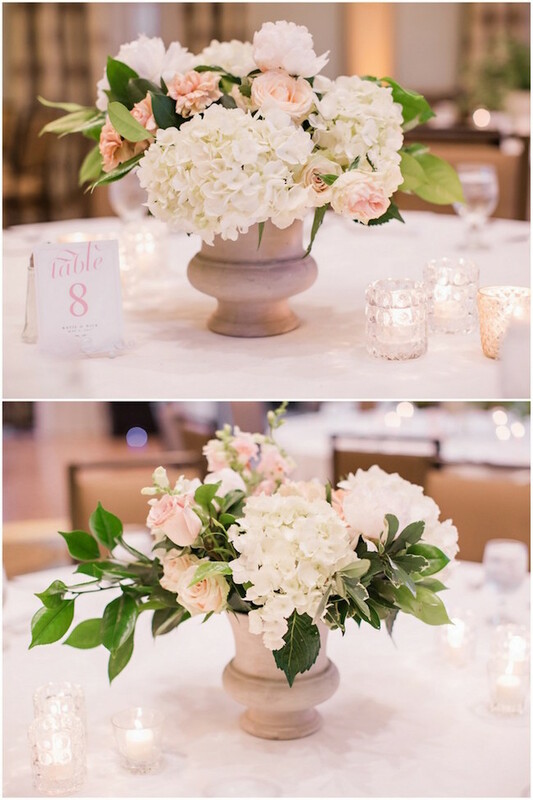 My floral designers were a dream come true creating centerpieces which were unique to each table. We love drink koozies and have a huge collection. We ordered 4 different colors of personalized drink koozies for our wedding. The next day, I realized we had NONE left! They were a hit! I had one large bridal portrait on display, with smaller portraits on the other tables on display in the veranda outside of our ballroom. Hire a wedding planner! I planned my wedding alone as I was starting my own planning business and wanted to do it myself. In the end, I was so happy with the hard work, sweat, and tears that I put into the wedding, but I definitely shouldn’t have had more fun with it along the way. 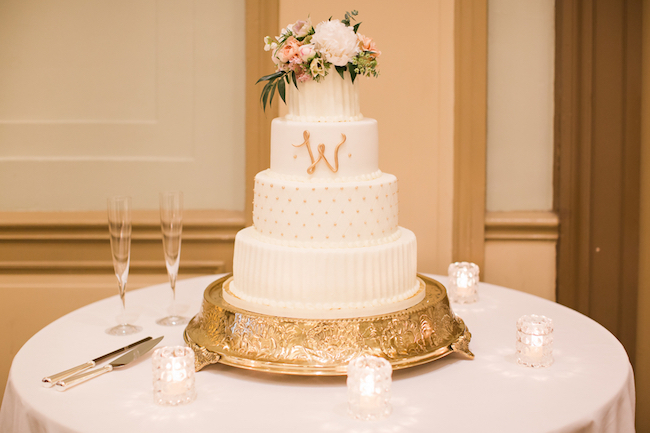 My word of advice to other brides – hire a wedding planner (like ME!) and let them handle all the bumps along the way. This is the most exciting time of your life, and you should enjoy every second of it! 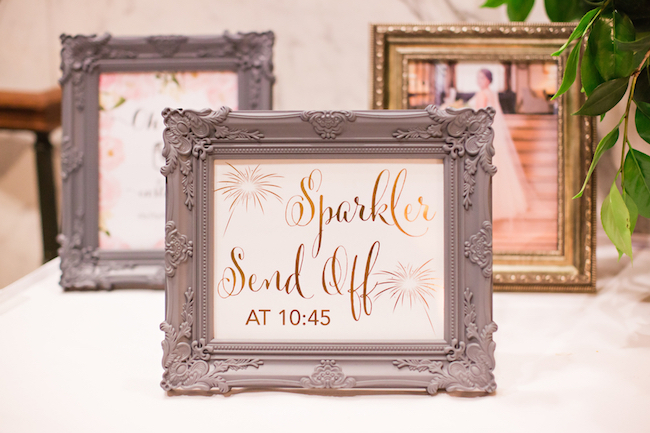 You can order invitations online that can be just as lovely as hand calligraphed ones! I felt so much pressure to have a calligrapher do my addressing of invitations as well as having a local print shop print them. That was going to cost an arm and a leg! I ordered my invitations from Weddingpaperdivas.com and Minted and had them printed on thick, luxurious card stock, and done with rose gold real foil letter press. They were BEAUTIFUL! Everyone gave me so many compliments on them and how they were so unique to me, gorgeous, and that they had never seen invitations that beautiful that weren’t hand done! So, not only did I save a fortune, I also felt so touched that they were a hit and that I didn’t “HAVE” to do it the traditional way after all. When searching online for decor, use rental companies to save on costs. Get a discount by waiting to order things like favors, napkins online around any holiday! Check out ETSY for amazing wedding items! They have the best selection out there for signage, guest book sign, hashtag signs, menus, etc!